Located on the way to Mt. Makalu Base Camp, the Makalu Barun National Park is the highest protected area in the world and Nepal’s last pristine wilderness where very few have ventured before. It is spread over an area of over 1500 square kilometers which extends from low ranges at 500m to the high Himalayas at over 8000 meters where you can enjoy the spectacular views of rugged Himalayan Peaks including Mt. Kumbhakarna (7,129m), Mt. Chamlang (7,319m), Mt. Makalu II (7,678m), Mt. Barunotse (7,129m) and Mt. Himachuli (6,424m). The stunning contrasts, where high waterfalls cascade into deep gorges and the colorful landscapes along with the craggy rocks rise from lush green forests make this trek truly mesmerizing. It is also well known for its clean mountain ecosystems on earth as it shelters over 3000 species of flowering plants, 75 species of mammals, and 440 species of birds, which include the endangered Clouded Leopards, Musk Deers and Red Pandas. Combining some serious flora and fauna with some strenuous hiking, the trek ascends towards the highest trekking peak in Nepal, the Mera Peak which lies at 6476 meters which is situated on the edge of the famous Khumbu Region and dominated by the Mt. Everest. This trek presents a moderate mountaineering experience for those adventure seekers who have a good level of physical fitness. Technically, the climb is pretty straightforward as ascending snow slopes rarely exceeds 40 degrees even though the peak is very high and physically demanding. The trek follows standard route from the north which involves high altitude glacier walking. The ease of reaching this elevation may be its biggest danger but good weather and snow conditions are, of course, necessary for safety and success. All climbers are recommended to partake in preparative fitness and altitude training before attempting this trek. We will take a flight from Kathmandu to Lukla(2840m), which will take around 30 to 35 minutes and then from Lukla we will trek to Chutang (3020 m above sea level). From Chutang we will trek to Zatrwa La Pass (4610 m above sea level) and from Zatrwa La Pass we will head towards ThuliKharka(4410m). After a fulfilling breakfast at Thulikharka we will head towards Kote(4182m above sea level). From Kote we will move on to Thangnak (4356m above sea level). We will spend the entire day resting and relieving some tiredness at Thangnak. 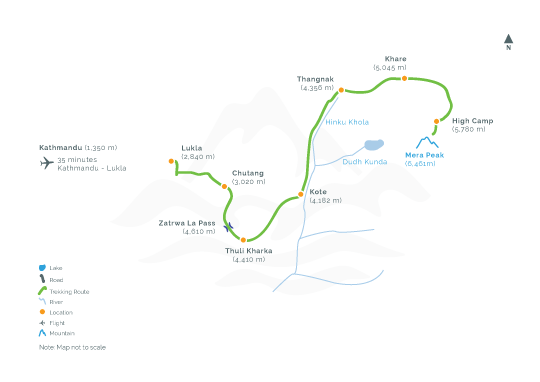 We will continue our expedition with a trek from Thangnak to Khare (5045m above sea level). At Khare, we will have a thorough equipment check and get our selves prepared to continue our trekking the next day. From Khare we will head to High Camp (5780m above sea level). From High camp we will reach our main destination of the trip, Summit Mera peak(6461m) and then we will head back to Khare camp. From Khare Camp we will head back to Kote. From Kote we head back to Thuli kharka. From ThuliKharka we will head back to where we first began,Lukla. We will fly back to Kathmandu from Lukla.